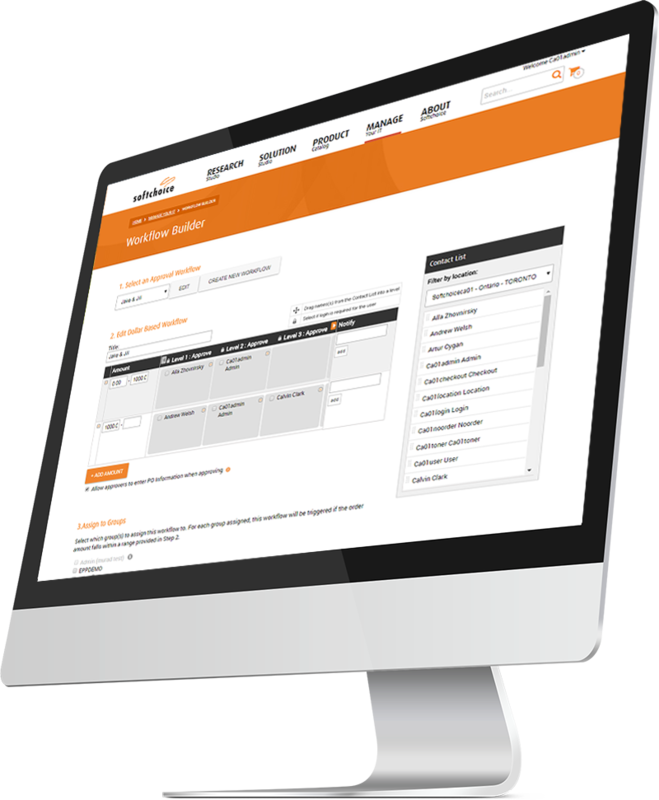 Workflows are a powerful feature that allow you to setup a customized order approval process for your Softchoice orders. Using our easy-to-use Workflow Builder, you can setup a fully customized order approval workflow assigning users responsible for approving/rejecting orders. We provide a number of supplementary tools to give you visibility into pending approvals and statistics to help ensure your order process is running smoothly. Our easy-to-use Workflow Builder allows you to implement a custom order approval process by setting limits on purchasing activity for any group of users according to specific spending thresholds. Quick access to pending orders for you to review and approve directly from your Springboard. Order Approval Statistics give you insight and visibility into your workflow process helping you to ensure your workflow is running optimally. Combine the convenience of Softchoice Standards Lists together with a custom workflow to ensure only your company's standard products can be ordered. My organization requires three levels of approval before an order can go through. Is this supported? Yes, Workflow Builder supports any number of approval levels. You can even assign multiple users to the same level in the event an approver is out of the office or unavailable to approve the order. What if I only need orders over a certain dollar amount to go through the approval process? When setting up your workflow, you can choose order limits which trigger a workflow. For example, you can setup a workflow for all orders over $5,000 to require a managers approval, while all other orders under that amount will go through. I'm not always in the office, and need the flexibility to approve/reject orders on the go. What options do I have? You can easily approve/reject orders via email. You can also login to Softchoice.com on your mobile phone for quick access to your Springboard. What other types of workflows can I setup? In addition to dollar based workflows, you can also setup a Standards List Workflow. This type of workflow helps ensure that only your company's approved products can be purchased. Can I assign a different order approval process for different groups? Yes. You can have a number of different workflows setup, each assigned to different groups as needed. To enable Workflow and Approvals or to learn more about this feature, fill out the form below. A member from our Sales team will reach out to you shortly.